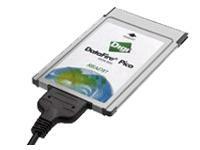 DataFire Pico is a passive PCMCIA ISDN adapter with extremely high net throughput rate. Simple to install, it provides for file transfer, telephony fax G3 and answering machine functionality. DataFire Pico is available with full CAPI, supports for Microsoft Dial-Up Network, NDIS WAN Miniport to enable multilink PPP connections with up to 128 kbit/s and COM port driver.